California sparkling wine often gets short shrift because it isn’t Champagne, but it shouldn’t precisely because they’re from two very different terroir (environments). Generally, we find comparisons like this odious. California sparkler quality has enormously improved over the years. In this tasting we sampled Brut and Blanc de Blancs, which for us offer the finest flavor, finish, and value in California sparklers. 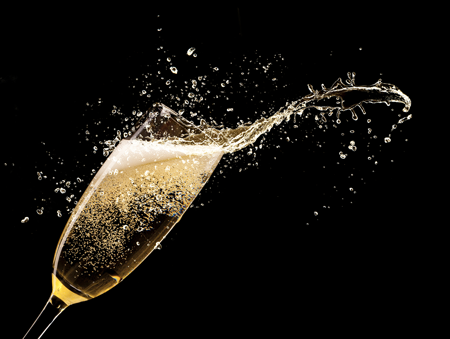 No offense to other sparkling blends, but most are too sweet for our tasters’ palates, and California wineries may be making sweeter sparkling blends to attract a younger wine drinking consumer. Can we agree that sparkling wine tasting notes and food pairings are often alike? (Wine tasting notes remain largely unread and are treated suspiciously, if not comically, by many consumers.) That to varying degrees each sparkler has crisp aromas of brioche, bread, and toast, with flavors of apple, pear, fig, lemon, hazelnut, honey, nuttiness, minerals, and possibly anise. That the wine pairs beautifully with oysters, lobster, salmon, caviar, paté, chicken, and veal. That said, with sparkling wine—or with any wine for that matter— finish is everything. Thus, rather than repeat our tasting/pairing notes, we offer our readers the top sparklers with the best finish. What’s the best finish? It’s a wine that offers elegance and length and is well focused. In short, the finish has something to say. Because they have more body, Brut (blend of Pinot Noir and Chardonnay) and Blanc de Blancs (all Chardonnay) best speak to finish. For the most part, the wines below have finish, and many are generous and rich as well. Readers should especially note that the Vintage Blanc de Blancs are of extremely high quality. Our offerings are either 4 stars (Excellent) or 5 stars (Outstanding). Where we felt it appropriate, we offered a “Best of Show.” As always, we ignore numerical ratings, which have become so bloated as to be meaningless to all except wineries, distributors, and retailers who market such things to consumers who chase numbers.